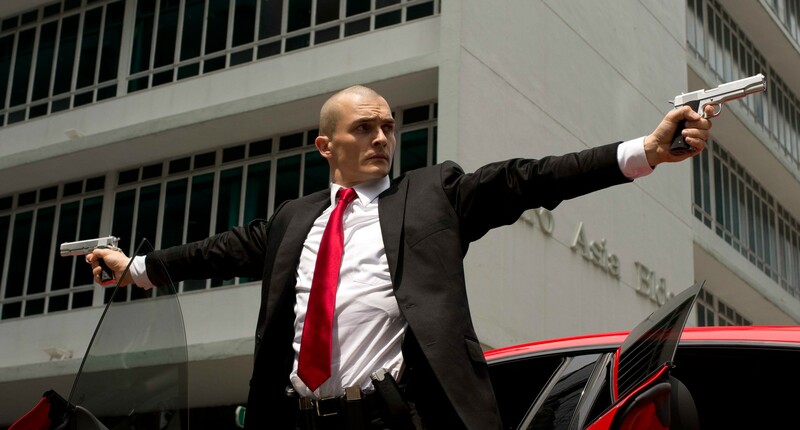 Hitman: Agent 47 is the second attempt at adapting the popular Hitman videogames series into a Hollywood hit film. The first attempt Hitman (2007) tried and failed miserably to turn the beloved videogames into a successful film franchise as not many people went to see it and even people fewer liked it. The production and writing team behind Hitman return to hit their target of righting their wrongs of the previous film in this reboot. Do they succeed? Unfortunately not, as Hitman: Agent 47 is a big, and I mean BIG, miss. The film starts off with a voiceover telling us that geneticist Dr. Peter Litvenko, the lead scientist who helped create assassins with enhanced strength, speed, stamina and intelligence called “Agents”, has been missing for years. Litvenko fled after having a change of heart when he realised he’d created the ultimate killing machines, and took the secret “Agent” formula with him while leaving his young daughter Katia behind. 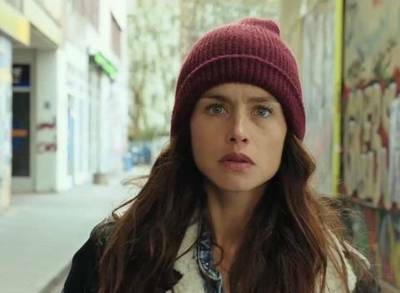 We meet an adult Katia in Berlin, where she’s been desperately looking for a trace of her father. She’s not the only one, as the sinister Syndicate International are also on Litvenko’s trail as they want to find the doctor so he can restart the “Agents” program for them. 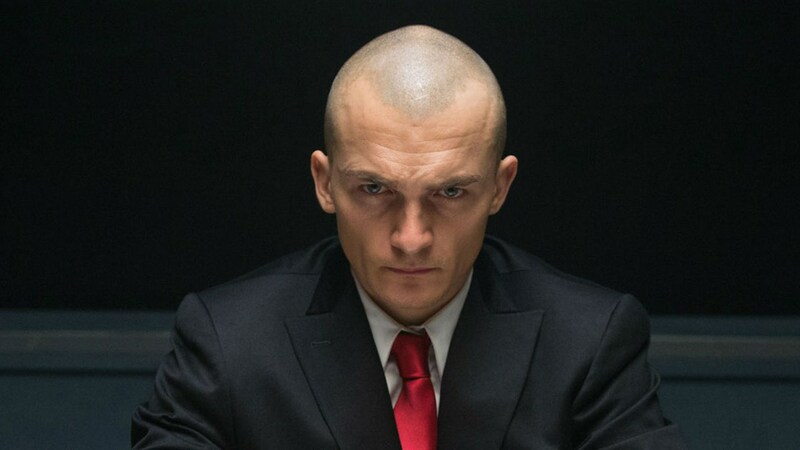 They plan to use Katia to locate her father, so Agent 47 (Homeland’s Rupert Friend) is tasked by his employers to find her before Syndicate International do. 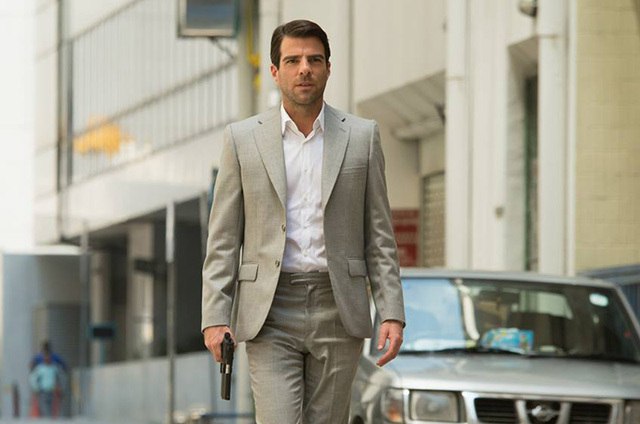 Also in the mix is a CIA operative named “John Smith” (Heroes and Star Trek’s Zachary Quinto) who approaches Katia in subway station and vows to protect her from Agent 47 and the Syndicate International. But all isn’t what it seems as the tug-of-war for Katia churns out some twists and turns. This cat-and-mouse plot of Hitman: Agent 47 had the potential to make for an entertaining and interesting action thriller. However, the film is neither entertaining nor interesting as the terribly poor execution of a promising story makes watching the film feel like a chore. The script feels like it was written by an amateur/student writer (just like this review – but hey at least I’m honest about it) as at times the dialogue is either totally predictable or extremely uninspiring which means you spend a lot of time rolling your eyes whenever somebody talks. As well as the script being bad, none of the characters grab your attention partly due to their unimaginative writing and partly due to some dull performances. There’s also no humour whatsoever in the film, which means that, apart from the actions scenes, there’s very little fun to be had. To be fair to Friend, Agent 47 is not supposed to be a barrel of laughs as he’s a cold, calm and calculated assassin who is Terminator-like in his approach to killing his targets. 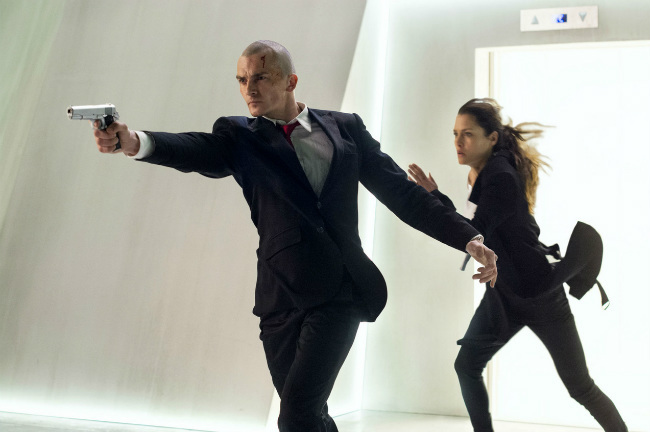 Friend plays the bar-coded baled-headed killer well but since Agent 47 lacks personality, an injection of charm and charisma is needed from someone else. Quinto tries desperately to make “John Smith” a compelling character but ultimately he isn’t given enough good material to succeed. Although Agent 47 is the titular character it turns out that the story of the film really revolves around Katia. Since Ware’s bland performance fails to make you care about Katia, you never at all care about the story. While the plot will probably send you to sleep, the action should wake back you up again as the shoot-em-up scenes are adrenaline-fuelled enough to hold your attention. 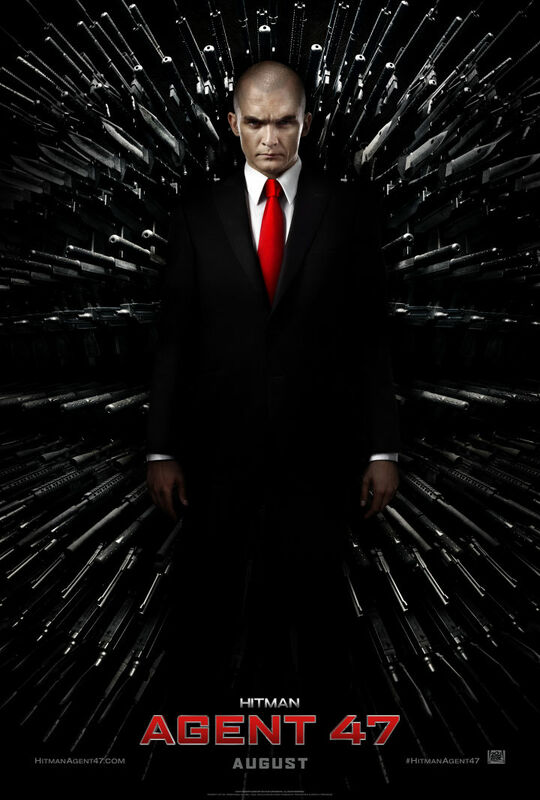 Watching Agent 47 unleash a barrage of bullets upon multiple faceless foes is fun to watch as the OTT violence will please those looking for some mindless action. A particularly memorable scene involves an inventive execution pulled off by Agent 47 which involves heavy duty clamps which will satisfy any bloodthirsty action fans. Agent 47 going toe-to-toe with “John Smith” will also please those looking for some rough and tumble. Although the action scenes give the film it’s only redeeming quality, some shoddy CGI and the obvious appearance of stunt doubles let the impact of these scenes down slightly.